Farah has five European Championship gold medals. Mo Farah is one of Europe’s most accomplished athletes. The 32-year-old distance runner has won two Olympic gold medals while representing Great Britain; three World Championship golds and a silver; five European Championship golds and a silver; two European Indoor Championship golds; and one gold, three silvers and one bronze medal from the European Cross Country Championships. Last Sunday, Farah added another highlight to his resume when he won the Lisbon Half Marathon (13.1 miles) in 59 minutes and 32 seconds to set a new European record. 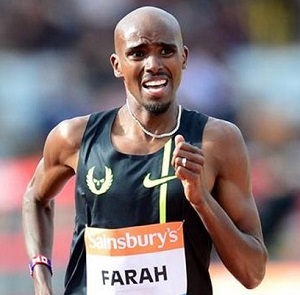 Farah’s time was 20 seconds faster than that of the previous record-holder, Spain’s Fabian Roncero. Some athletes are, at least publicly, nothing but gracious when a record of theirs is broken. Other athletes don’t react so well. Roncero, who has been retired for over a decade and now coaches runners, put himself on the latter list in eyebrow-raising fashion. Farah was born and raised Muslim in Somalia before moving to Great Britain (where his father was born) when he was eight years old. Farah is a British citizen and has only represented Great Britain in international track meets. His dramatic victories in the 5,000-meter and 10,000-meter runs at the 2012 Olympics in London was one of the signature moments of those Olympics, as the crowd at Olympic Stadium gave Farah the kind of raucous ovations reserved for hometown heroes. But according to Roncero, Farah — who also holds the European records for the 1,500 meters and 10,000 meters — isn’t British enough to hold a European record that doesn’t have an asterisk next to it.